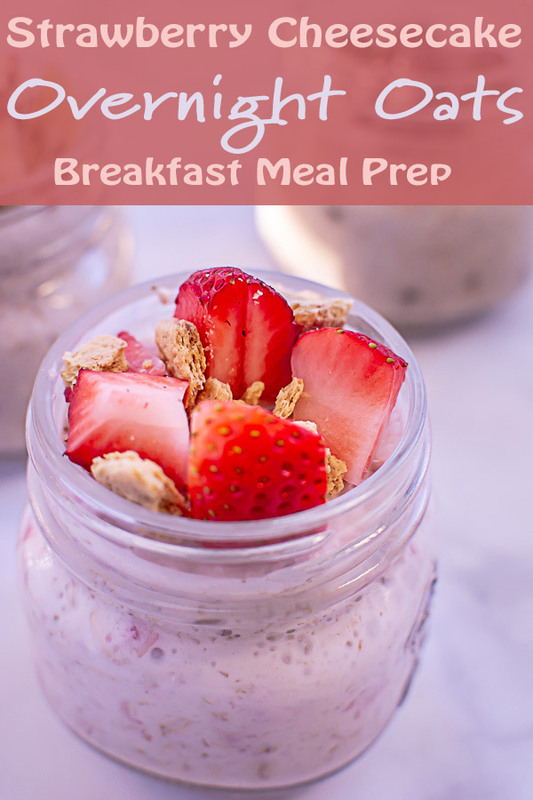 Does anyone else struggle with the morning stress of creating and eating healthy breakfasts? Do you end up eating great on Monday morning and then by Thursday you are pulling whatever you can find out of the fridge and by Friday you have totally given up and now you’re eating that muffin at Starbucks? You know, the OUTRAGEOUSLY EXPENSIVE MUFFIN! We’ve all been there. 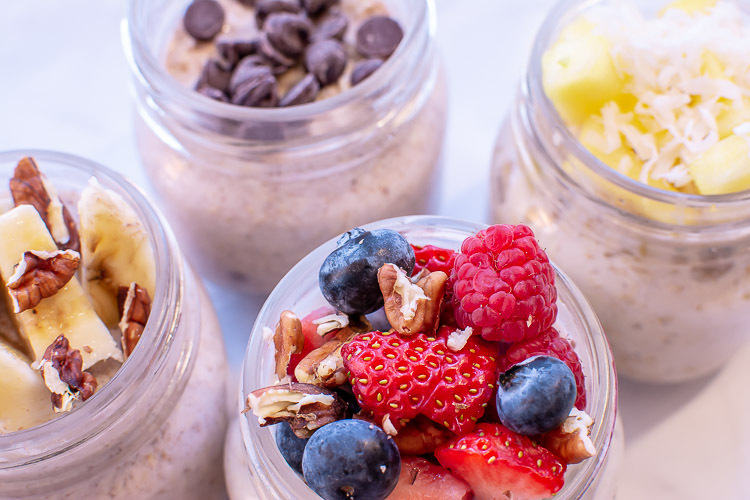 These healthy overnight oats recipes are so easy to make ahead that you’ll easily be able to stick to that yummy, cheap, and healthy meal plan. 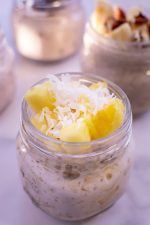 We’ve created 5 Incredibly Easy Healthy Overnight Oats recipes for you to make on a Sunday to have you taken care of for the whole week! 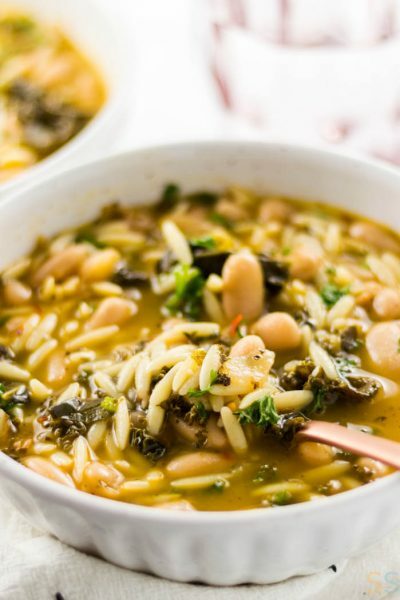 Each recipe will make enough for 2 servings so this is great if you are making it for you and your significant other! If you’re just cooking for yourself, make 3 and you’ll have enough for Saturday morning too! 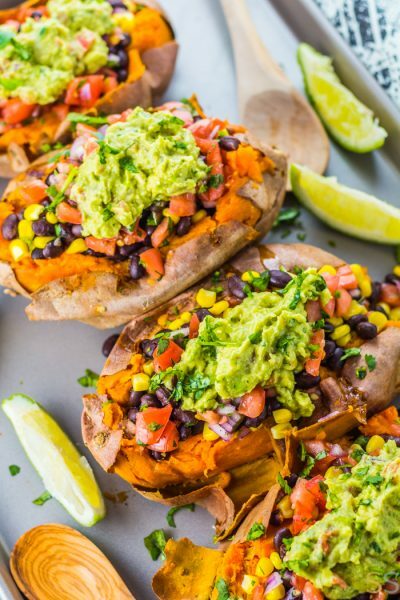 Each of these recipes can be made in less than 5 minutes, so this meal prep won’t take up a lot of time and it offers a huge payoff towards the stress-free week ahead! Eating these will make you feel like you are in the land of palm trees, sandy beaches, and grass skirts. Ok, maybe that is a bit of an exaggeration, but you get the idea. When you bite into it, the tropical taste will wow you! If you don’t enjoy pineapple or mango, double up on an other fruit or substitute them with papaya or guava (also delicious). 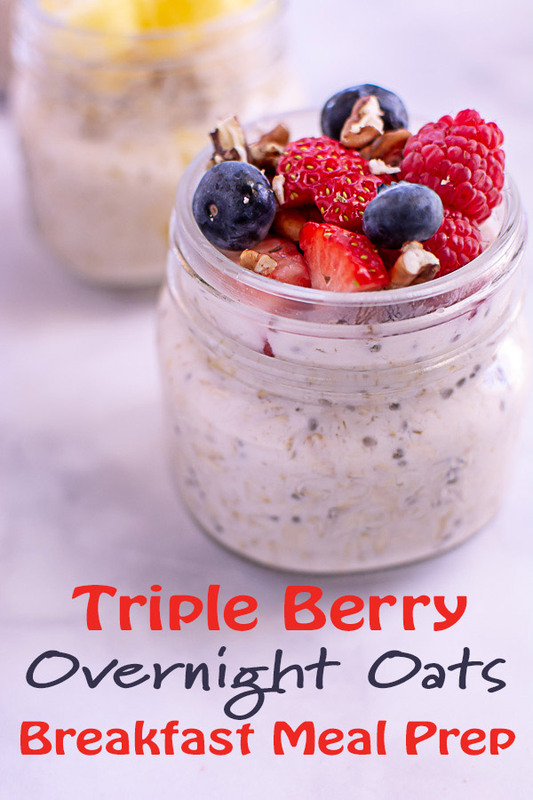 I had leftover berries from other recipes and mixed and matched them for this healthy recipe. Pro Tip: Leave out the nuts and add them in the morning, otherwise they will lose their crunch. 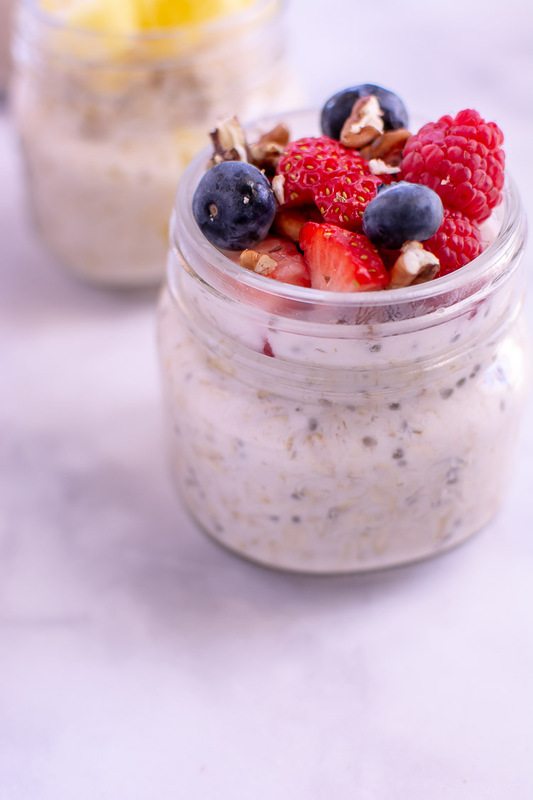 The chia seeds offers omega 3 fatty acids (which help prevent heart disease), protein and fiber. I found that this recipe filled me up longer. This was a huge hit with my family! I love a healthy breakfast that tastes like I am having dessert! The little bit of cream cheese mixed with the yogurt and Almond milk is going to shock your senses into thinking you are eating dessert, I promise you! Don’t forget to put the ingredients through the food processor, though. It won’t pull together as well if you skip this step! 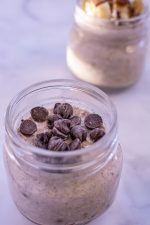 The first bite mixes the mild taste of cinnamon and chocolate with the creaminess of the oats. 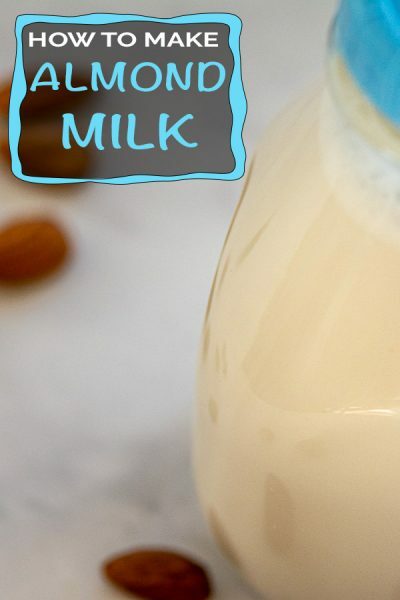 I can’t tell you how thrilled I am with the Almond milk in these recipes and will use it more in the future. 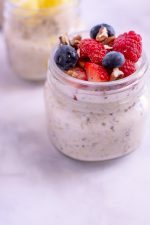 We kept saying how creamy the oats were! 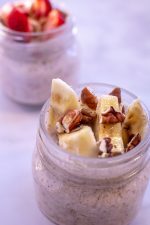 This recipe maintains the traditional oats flavor and complements it with the bananas and nuts. I love the flexibility with this recipe. It is easy to add a dollop of honey to sweeten it, or include a tablespoon of Nutella to add a bit more of the taste of the nuts. 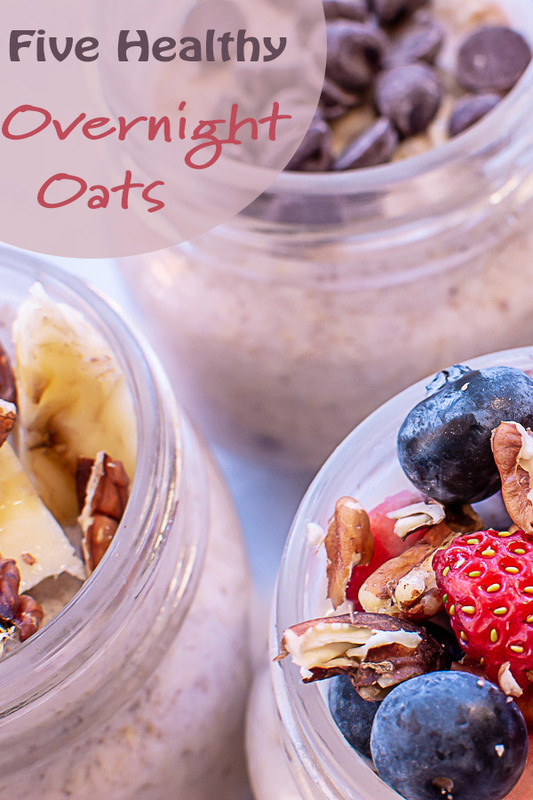 Five different make-ahead Overnight Oat Recipes that will reduce stress from your weekly meal planning efforts. These take less than five minutes to make and will help you eat healthy for breakfast. Combine oats, milk, yogurt, honey, vanilla in a bowl and stir. Divide into two containers and put in fridge for overnight. Top with chopped up mangos, pineapple and sprinkle with coconut. Combine the oats, milk, yogurt, vanilla, honey and chia seeds in a bowl and stir. Divide into two containers and put in fridge overnight. Top with raspberries, strawberries and blueberries (or any three berries of your choice!) and add crushed pecans on top. 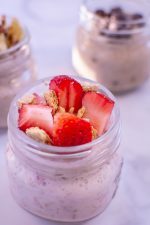 Combine oats, yogurt, vanilla, honey, cream cheese, ½ cup strawberries and milk into a food processor. Divide into two containers and put in refrigerator overnight. Top with strawberries and crushed up graham crackers. Combine oats, milk, yogurt, vanilla, cinnamon and chocolate chips. Stir to combine. 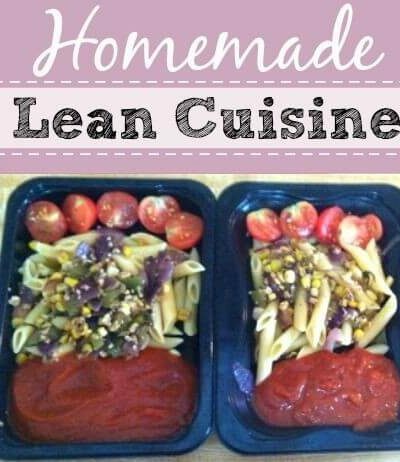 Place in two containers and put in refrigerator overnight. Sprinkle with extra chocolate chips and crushed nuts, if desired. Combine oats, milk, yogurt, vanilla and cinnamon together and stir. Stir in ½ of a banana chopped. 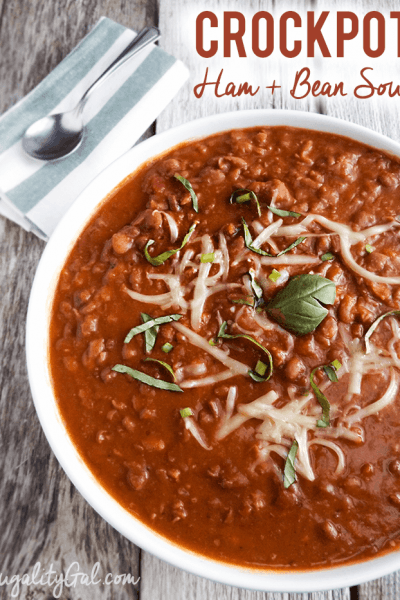 Place all of the ingredients in two containers and put in the refrigerator overnight. Top with chopped bananas and chopped nuts.